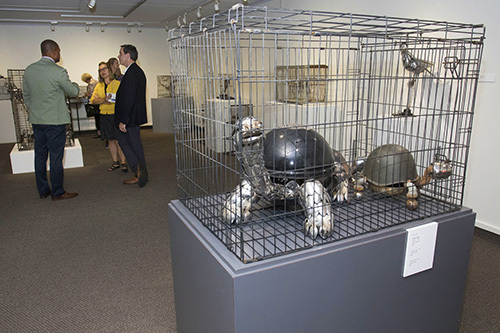 Visitors to the Art Museum of Greater Lafayette check out the exhibit “Caged: The Illegal Pet Trade” at an opening reception Friday, September 22. The exhibit is co-sponsored by Purdue Veterinary Medicine, the City of Lafayette and the Columbian Park Zoo. “Caged: The Illegal Pet Trade” is the title of a new art exhibit at the Art Museum of Greater Lafayette co-sponsored by the Purdue University College of Veterinary Medicine. The exhibit features a collection of wonderfully clever animal sculptures created by Artist Justin LaDoux, who says the purpose is to shed light on this important, but often neglected subject. LaDoux makes the exquisite animal shapes using found objects, such as spoons, forks, knives and other kitchen utensils and tools. The figures are displayed in cages and depict a variety of exotic species, including birds, monkeys, penguins, turtles and chameleons. “Animal health and well-being is our specialty, and everyone in the College of Veterinary Medicine encourages responsible pet ownership,” said Purdue Veterinary Medicine Dean Willie Reed. “The illegal pet trade is a cruel, inhumane business, and this outstanding art exhibit is an excellent means of educating people about this issue.” The exhibit opened Friday, September 22, and runs through November 26. Dr. Corriveau also said that many owners do not have adequate knowledge, financial resources or capability to adequately replicate a natural habitat for an exotic pet in their home. Even when proper care can be afforded, sometimes finding that care can be difficult. 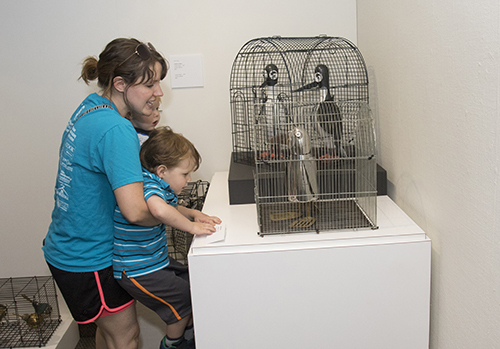 A “Thank You Fest” organized by radio station WBAA at the Art Museum of Greater Lafayette Saturday, September 23, attracted families who enjoyed checking out the animal sculptures that are part of the “Caged” exhibit. Dr. Corriveau stressed that those seeking to own an exotic pet should have the knowledge, financial resources, skill, time and available help to properly care for the animal. She also said people looking to own an exotic animal should consider rescuing the animal from a reputable rescue organization. LaDoux is a member of the art faculty at Kirtland Community College in Roscommon, Mich. He earned his BFA degree at Kendall College of Art and Design and lives in Alma, Mich. LaDoux has created uniquely-themed installations for the annual Grand Rapids Art Prize competition. In 2016, he created the “Caged” exhibit and agreed to expand it and bring it to the Art Museum of Greater Lafayette. The other co-sponsors of the exhibit are the City of Lafayette and the Columbian Park Zoo. The Art Museum of Greater Lafayette is located at 102 S. 10th Street in Lafayette and is open daily from 11 a.m. – 4 p.m. Admission is free. The exhibit also was the featured attraction at a Thank You Fest hosted by WBAA Radio at the museum Saturday afternoon, September 23.